If you live with a clutterer or messy person it can be difficult to declutter and clean up your home without upsetting them, especially without their cooperation and assistance. 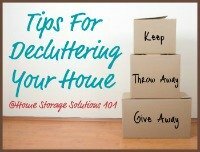 I noticed, when many of you shared your biggest stumbling blocks to decluttering your home in the comments of the Decluttering Your Home Series introduction, that you felt constrained in your ability to remove clutter from your home because of a spouse or other loved one who was the person (or one of them) bringing and/or keeping all that stuff in your home. You see, of the two of us, my husband is not the pack rat -- I am. Therefore, through most of our marriage I have been trying to tame my own tendencies, to accumulate stuff while at most he has only a mild case of it. 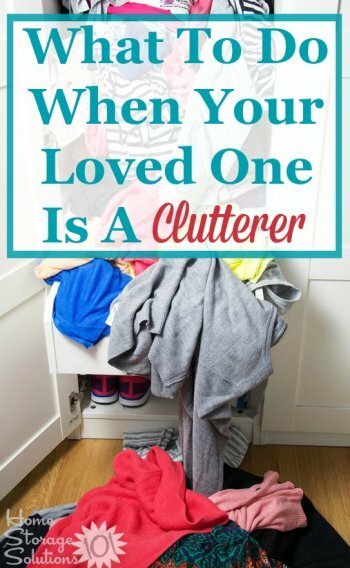 It can be hard enough controlling yourself, and dealing with your own clutter. What should you do when someone else is the clutterer in your home, especially when that someone is someone you love and cherish? The first thing you need to consider when figuring out how to deal with someone who is cluttering up your home is to think about who they are, since this will impact how you can deal with them. This is the easiest category of clutterer to deal with, at least in my opinion. When kids no longer share your space the stuff they leave behind is just clutter for you. When sharing living space with someone, as with the two categories of clutterers below, you've got to have some give and take, and compromise is often in order. However, if you don't have room for someone's stuff who doesn't live there, you are not required to hold onto it any longer. Now, don't just start throwing it all out today though. As I'll discuss more below, making decisions about someone else's stuff, such as to trash or sell it, is a big no no. However, you can give your kids (or anyone else who is storing stuff in your home) a reasonable amount of notice to remove their stuff from your home, along with telling them what you'll do with it if they don't remove it by the deadline. This is a simple and fair way to deal with this type of stuff, which treats both your adult and independent kids and yourself with respect. Whether they pay rent or not, you've chosen to share your space with them out of love and obligation, and you should consider their feelings and emotions when dealing with their stuff. They are your kids though, so to an extent, you can dictate what they do. I know, some of you are laughing at this -- it is true, you can only control anyone so much. However, you can't argue that you have more control and authority over your kids than with just about anyone else. That means, at least to a certain extent, you can tell your kids to go clean up their room and get rid of half of their stuff if you want to. However, I would urge you to temper your authority with compassion. Just like you, kids can often suffer from emotions chaining them to their clutter, and at least in the case of my kids many of those behaviors and emotions can be tied to me or lessons I've taught them, perhaps unconsciously. Therefore, I suggest treating the decluttering process with your kid clutterer as a learning process. You can help them address the emotional aspects of decluttering, along with teaching them practical tips and tricks for organizing and purging items from your home. 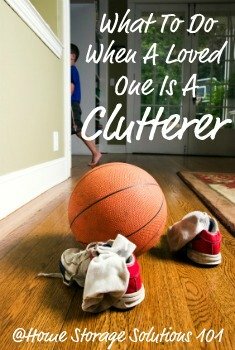 This addresses the clutter problem in your home, and also helps prepare your kids for their lives once they have their own homes to take care of. This leads me to the trickiest group of clutter bugs to deal with -- your spouse, partner or roommate. At least with a roommate you can just decide not to live together anymore if you can't deal with their clutter. However, we often want to keep living with our spouse or partner despite their mess. Instead, we just want improvement in our current living situation. I think the most important thing to remember when dealing with a spouse's clutterer is compromise. No one can ever have everything their own way. Ideally, both of you will come to address the issue of clutter in your home together, since it effects you both. There should always be, on both sides, give and take, considerations of fairness, and treating others the way you would want to be treated. To the extent one partner basically says, "I'm not getting rid of any of my stuff, period" than this is really not an issue about someone just being a clutterer. Instead, this is an issue dealing with something more emotional -- the issue of control. That kind of issue is really beyond the scope of this article, and instead I suggest you and/or your partner see a counselor or marriage therapist to work out these broader issues before trying to deal with your clutter. 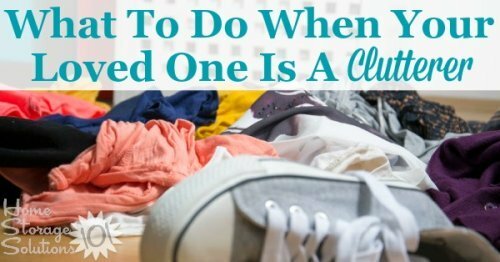 No matter which category of clutterer you're dealing with, it is easiest to deal with the excess stuff in your home together, as a team, whenever possible. That means you've got to try to get the person to cooperate with your decluttering efforts, and the best way to go about that is to let them buy into the process, and see how it can improve their lives. As I'm sure you know, being forced, punished or nagged into doing something may get some results, but isn't likely to last for long, and any changes made will be, most likely, superficial. Instead, encourage them to give it a try, be positive about their results, however small, and lead by example. Show the benefits instead of just talking about them. It is amazing what results can do to encourage others to start too. In addition, really communicate with the clutterer as you work through the decluttering process together. Talk to them about why they might want to keep an item, or to throw it away, and help them come to their own decisions about the items. Sometimes this is easier for a person to do with a neutral third party instead of someone close to them. If you cqn hire a professional organizer or bring in a organized friend, this may be a good step to keeping peace and harmony in your home. What should you do if you can't get a loved one to clean up their own mess? 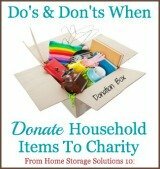 If you can't get a loved one to cooperate with the decluttering process you're really between a rock and a hard place. As I mentioned before, the problem may be more than just clutter but something deeper within your relationship or with their emotions that counseling may help with. However, in the mean time, what can you do for you, to make yourself feel better? My suggestion would be to work on your own clutter first. Improve the areas you can improve, and lead by example. In addition, you can try to corral the clutterer's clutter into designated spaces that they control, such as a bedroom, home office or den. If you can close the door, knowing the clutter is limited to that one area, perhaps that can be enough, at least for now. We all have flaws and imperfections, but we still deserve love. The same can be said for our clutterer loved ones, and since we're not perfect try to remember to treat your loved ones with compassion and caring while still dealing with your home's clutter problems. The main rule to remember here is to never, and I mean NEVER get rid of something belonging to the clutterer without their permission. All this does is replace a clutter problem for a lack of trust problem. Plus, tossing stuff on the sly can often backfire because it makes people less willing to part with anything else, even stuff that if they were making a rational, instead of emotional decision, they would readily part with. Think about it - you don't want someone coming along and throwing out your stuff without consulting you, do you? No, of course not. Well, neither do they. So treat them the way you'd like to be treated. Go slowly through the process, letting them work through it at a reasonable but steady pace, and deal with the emotional issues holding your loved one back from decluttering as you can. Then you'll have a stronger relationship and a clutter free home at the end of the experience. What Are Your Thoughts On How To Deal With These Emotional And Relationship Issues? I don't claim to know all the answers on this very difficult and emotional issue. I'd love for you to share your own thoughts below, in the comments, sharing your problems, concerns, ideas, and what has and has not worked for you when dealing with issues such as these. Next week, as part of the Decluttering Your Home Series, we'll discuss the last topic in the emotional area of decluttering (and after that we'll begin getting into the nitty gritty steps of the process). The next topic is about the misconception that home organization will cure your home's clutter problems. We'll discuss why there is no such thing as clutter organization.